Nuand have recently released their new bladeRF 2.0 micro software defined radio. The SDR has a frequency range of 47 MHz to 6 GHz on TX and 70 MHz to 6 GHz on RX, a bandwidth of up to 56 MHz, a 12-bit ADC and has 2 RX and 2 TX radios. There are two options for sale, the US$480 xA4 version and the US$720 xA9 version. The differences between the two appear to be entirely in the FPGA, with the more expensive version having an FPGA that contains many more logic elements which means that more DSP hardware can be synthesized on it. The RF transceiver chip used is the AD9361, which is the chip used on most high end SDRs like USRP's. 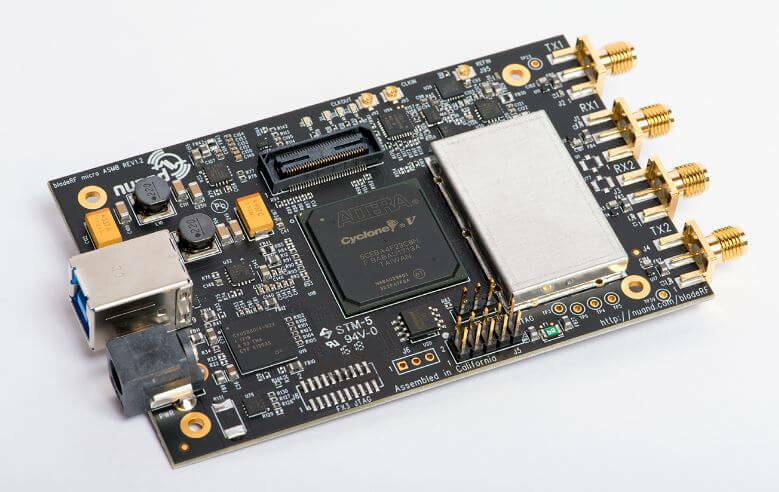 The bladeRF 2.0 micro features support for: GNU Radio via gr-osmosdr, Pothos via SoapySDR, SDRange, SDR Console, SDR # via sdrsharp-bladeRF, YateBTS, OpenAirInterface, srsUE & srsLTE, MathWorks MATLAB® & Simulink® via libbladeRF bindings. It would be nice to know what the number is for the noise floor is of the device ??????????????????????? and how many ghost images und spurii. how they handle the usb 3.0 noise issues ? It has a Cypress FX3 SuperSpeed USB 3.0 Controller same as an Ettus B210. It has a Analog Devices AD9361 transcever same as an Ettus B210. Ok it does not use the Xilinx Spartan 6 XC6SLX75 FPGA that is used in the Ettus B210, it uses a newer, bigger, better, lower power, faster, more modern FPGA. But since that is on the digital side of the board and there is an nice metal can attenuating any EMI entering the transceiver I don’t think it really matters to the actual RF performance. I would expect the RF performance to be very similar to the Ettus B210, but I am only guessing. Sorry wrong FPGA, It is a Spartan 6 XC6SLX150 FPGA (147443 LE’s and 11519 LAB’s) in the B210 vs a Altera Cyclone V FPGA (which is either a 49 kLE or a 301 kLE) in the BladeRF 2.0 Micro. So depending on the model of BladeRF 2.0 Micro it is either: newer, smaller/bigger, worse/better, lower power, faster, more modern FPGA.